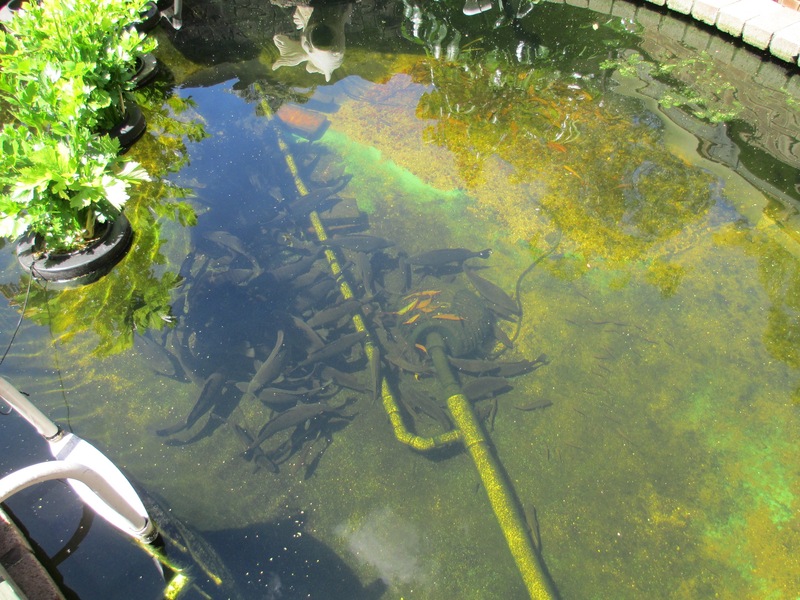 We have found quite a few people are interested in how we converted our swimming pool….from the standard chlorinated, filtered 6 hours a day type swimming pool……..to one that we now use to grow edible fish, as well as still swim!! Here is our story……. When we moved here in 1991 there was an existing concrete pool, which naturally the kids loved and spent many summer days in with friends. But then they all grew up….and there WE were, wanting a quick dip in and out to cool off in summer but having to continually monitor and clean the pool to keep it useable. So, after much discussion and research, we decided to convert the pool to enable us to still have those cooling dips, but to make it much more sustainable by growing fish in it too! We found great information on the Fisheries website regarding all different types of farmed fish and their requirements. We also discovered Backyard Aquaponics which, while mainly related to the growth of plants and fish at the same time, had a wealth of information on fish cultivation based on contributors’ experience. 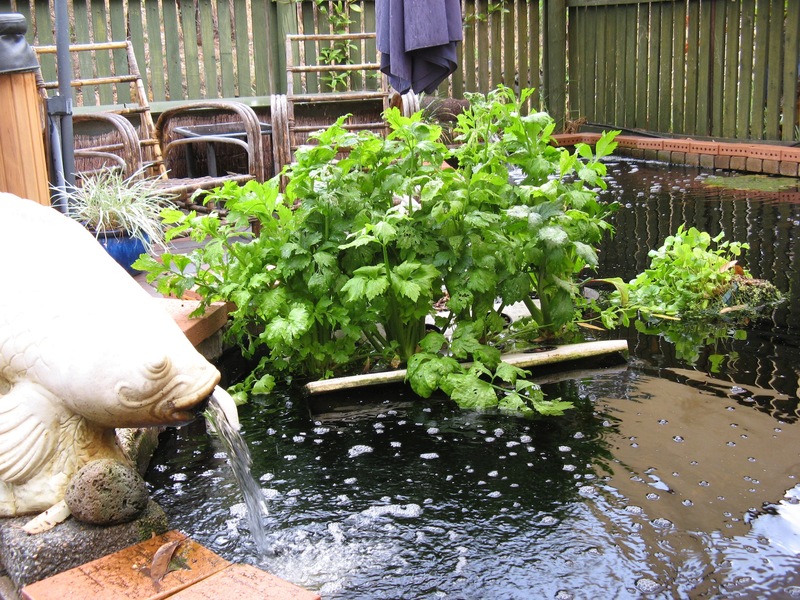 Although not many people had done pool conversions as we were planning to do, we really benefited by joining the forum and learning a lot of the ‘dos and don’ts’ about growing fish before we started. Another fabulous source was Patrick at Lotus Blossum Water Gardens. Although he too had no experience in pool conversions or growing fish for food, he had a fantastically clear Koi pond…..and we wanted the same effect albeit with edible fish. 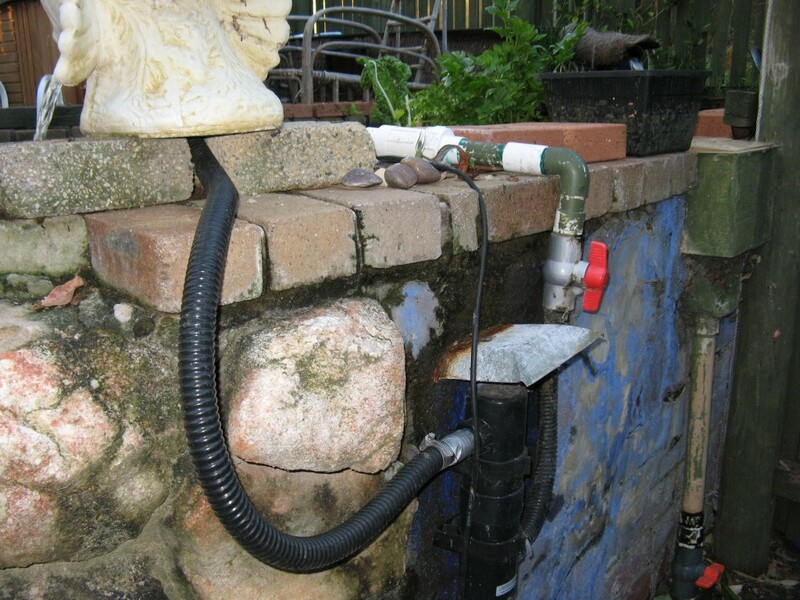 Patrick designed the filtration, circulation and aeration system with three outlets for our vaguely kidney shaped pool, and made the bio-filter to measure. In the photo above is the bio-filter at the back behind the chairs, with a large outlet into the narrow end of the pool. 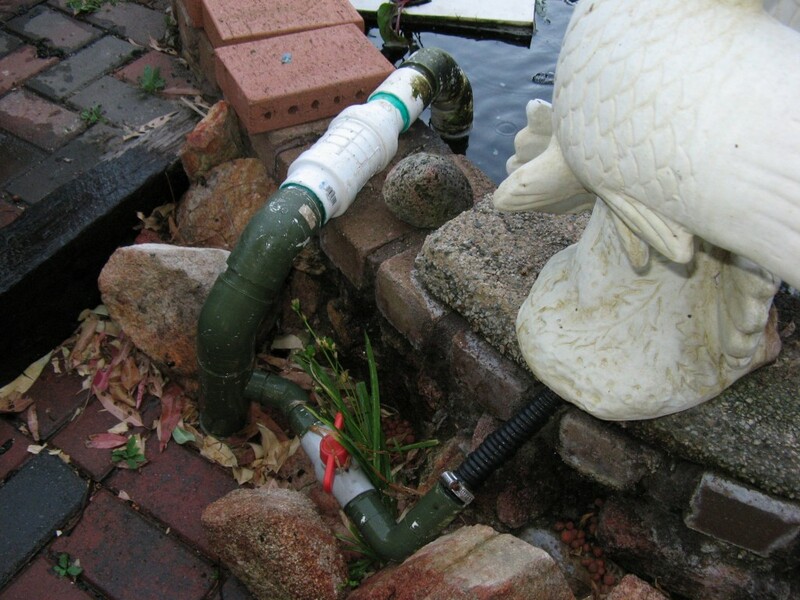 The two ornamental fish on either side are the two other outlets and their placement ensures there are no ‘dead’ areas of water in the pool that don’t get recirculated. Each of the three outlets are set above pool height to increase the amount of oxygen as the water cascades into the pool below. Their flow is regulated by individual taps. For our 10-11,000 litre pool, we also bought a submersible Oase Ecopump 16,000 to ensure circulation of 10,000 litres per hour. This pump uses 130W so is much, much more economical than running the pool filter which was an initial idea of ours. This meant that we could afford to run the system 24/7 which was going to be much better for the fish. 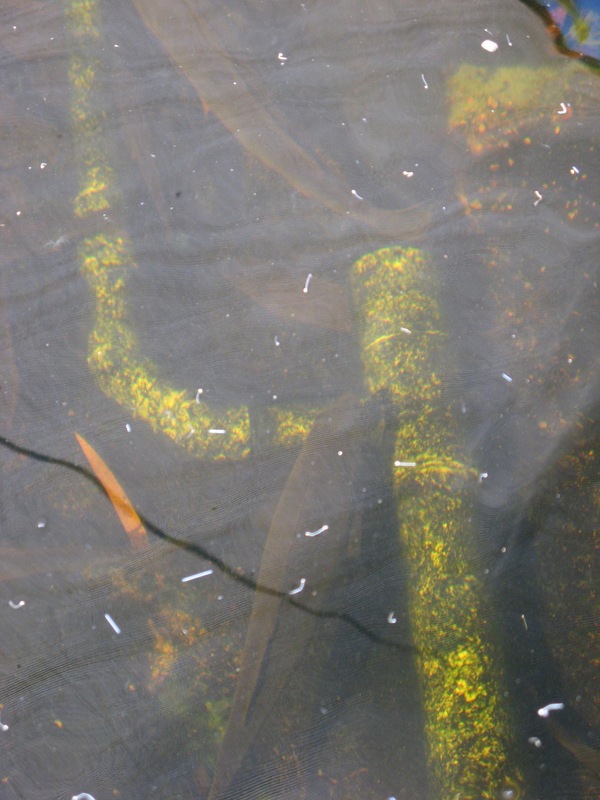 The pump is basically in the centre of the large part of the pool……..
with a large pipe running to one side along the bottom of the pool to the left ornamental fish, and a smaller pipe running off this to the ornamental fish on the right via a UV filter-clarifier to make it safer for swimming…….. The UV filter connected to the ornamental fish on the right-with a ‘cap’ to protect it from the rain. In the background is the pool filter, which we kept intact in case we needed more aeration. Each outlet pipe has its own tap so the flow of water could be adjusted to ensure a total of 10-11,000 litres per hour. The tap to the bio-filter also enables us to turn off the supply of water when the filter needs cleaning. We clean algae and leaves off the pumps outer casing once every couple of months diving on snorkel and using a hard hand-brush. 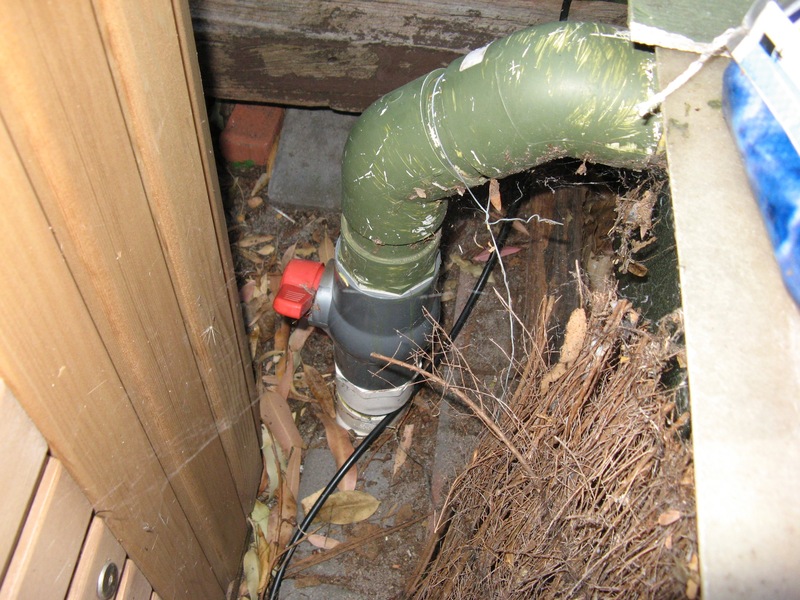 Should a more thorough clean or repair be needed, the pump, which has a flexible joint linking it to the outlet pipes can be removed by hand while diving on snorkel. Also the pipes themselves have threaded joiners at the top edge of the pool so the entire underwater section can be removed without getting wet. Removing the unit has proved invaluable when we were netting fish. Once all the infrastructure was in place, it was ‘simply’ a matter of purchasing the fish……but as with all good plans initially things went awry! Not too badly really, but we did lose some fish from our original purchase because the water was still too cold for barramundi, and because they had been roughly handled at the suppliers. We have learnt a great deal over the years though, and rarely have problems now. 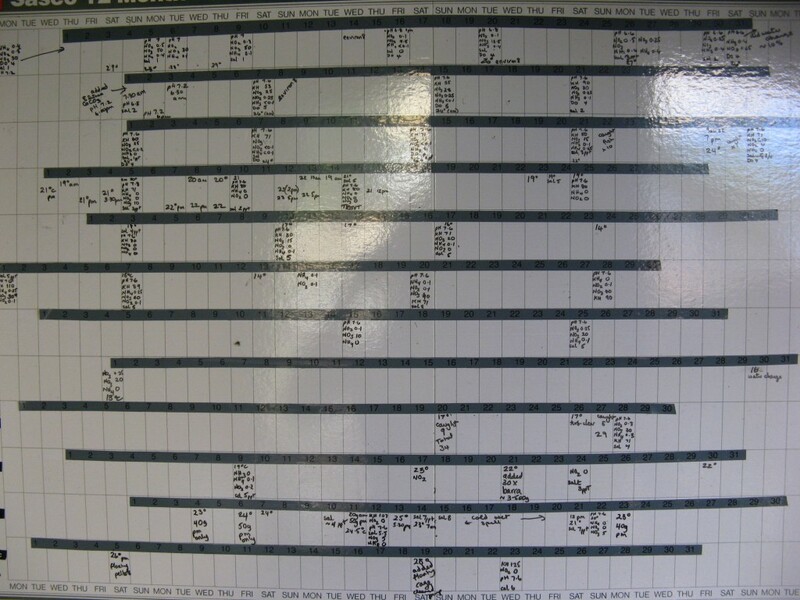 Monitoring water conditions and fish health is important but manageable, and we find a white board/planner nearby a handy way to record the results of water testing and observe any untoward trends over a period of time. 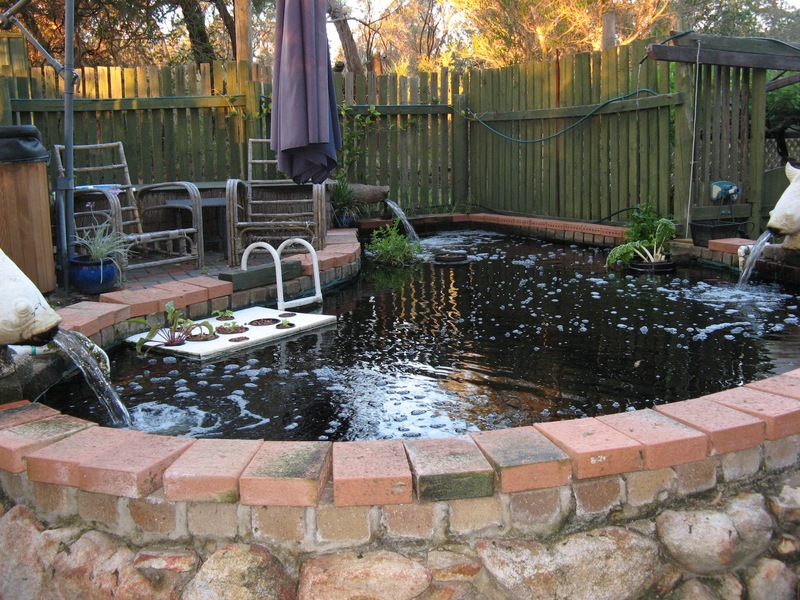 Since 2008 when we started this ‘project’, we had barramundi in the pool during the warmer summer months, and trout during the cooler winter months. Since spring 2011 we have had perch for a number of reasons outlined in the ‘perch’ page. All have been great! Because our main focus is on the fish and their health, rather than the plants as in aquaponics (we have a separate aquaponics system), we maintained a good level of salt (5ppt) in the water for the barramundi and trout. Even with this salt level we still managed to grow some vegetables in floating rafts and pots to supplement the veggie garden. With some trial and error, we worked out what would grow and what wouldn’t. in the high salt content. Now that we have perch permanently however, they do not like a high salt content so we maintain about 2ppt, and this allows a greater diversity of plants to be grown on the surface. Celery in particular grows like mad, and the perch nibble on any roots or bits that overhang, providing another source of food for them! After initially switching between trout and barramundi in the aquaponics system, and perch in the swimming pool, we now run trout in the AP over winter, then put in 50 perch fingerlings to feed up over summer. In April, we take out the perch fingerlings and add them to the others in the swimming pool. Unlike trout and barramundi, silver perch don’t eat each other so having a range of sizes in the pool doesn’t matter to them, and for us it means we now have a constant supply of perch.